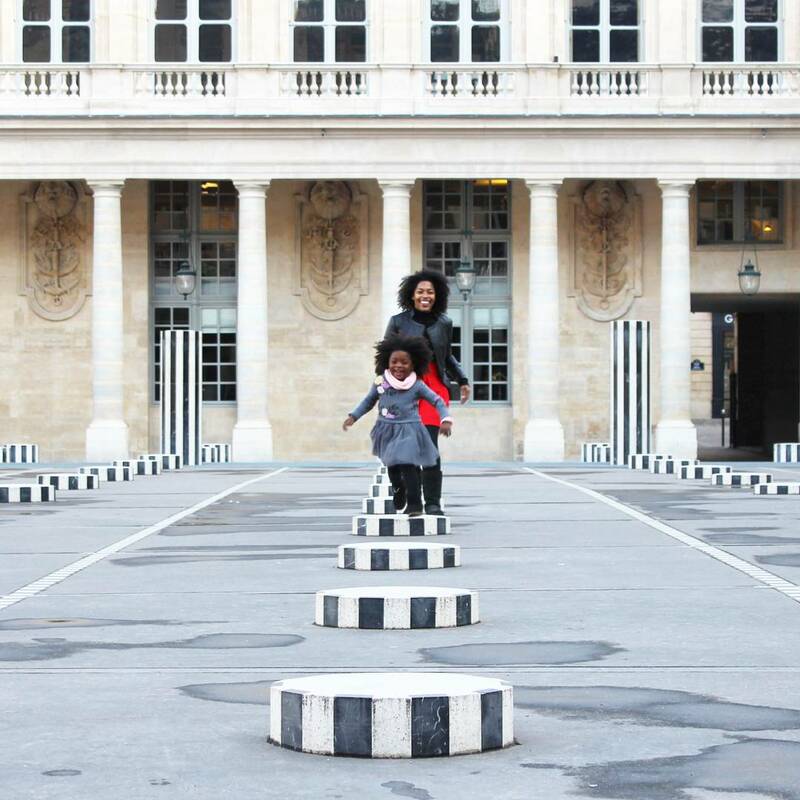 There are many things to do in Paris with kids. On our first trip we we only had one day in Paris as it was a side trip from Amsterdam. 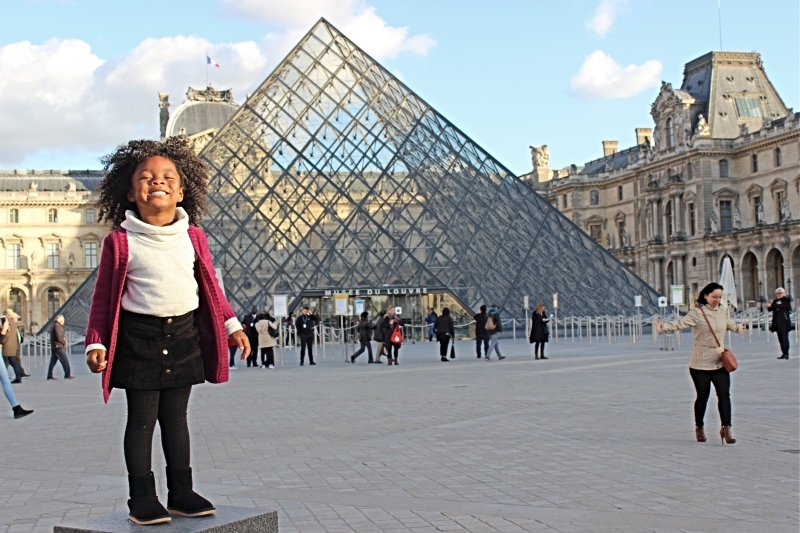 We were lucky enough to revisit this time spending 48 hours in Paris with kids. We were exploring Western Europe with our Eurail Pass allowing up to visit 6 cities in 5 countries by train on one booking. We started the trip by flying into London and then used our pass to take the Eurostar to Paris. We arrived to Paris via Gare du Nord, which is in the center of the city, much closer, then Charles de Gaulle airport. Traveling by train allowed us to avoid going through customs, immigration, and baggage claim upon arrival. We just grabbed our suitcase, exited the train and walked outside, so stress free! We stayed at Hotel Du Plat d’Etain, it was close to the train station and just a 13 minute bus ride to The Lourve. The hotel is great for families as they have rooms that have two beds, which we had. It had a King sized bed plus two twin sized beds and a bathroom with a tub. Finding a hotel in Paris with an elevator can be tricky and while this hotel’s elevator was small I was very happy to it had one. The neighborhood seemed nice enough and there were plenty of restaurants in walking distance. The hotel offered breakfast at an additional cost but we opted to eat elsewhere. 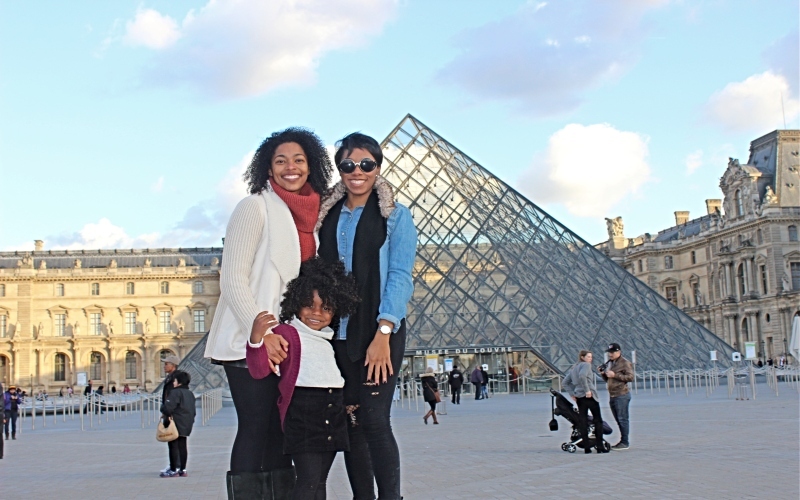 The Louvre is closed on Tuesdays so we had to see it on Monday. It closes at 6PM so we made it our first stop! We took the public bus from the restaurant to The Louvre. It was fall so the lines weren’t extremely long but if you visit in the summer I highly suggest you purchasing your tickets online in advance. 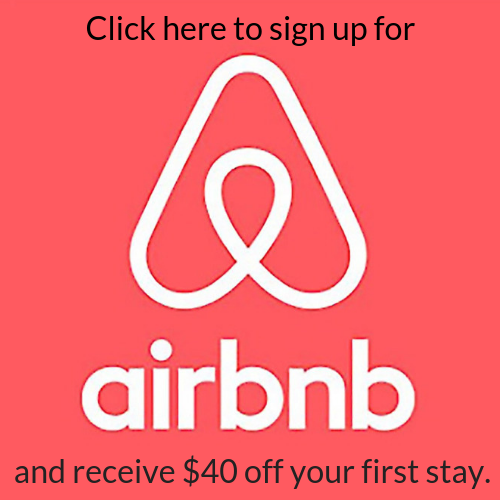 You can do so directly from The Louvres website at no additional charge. 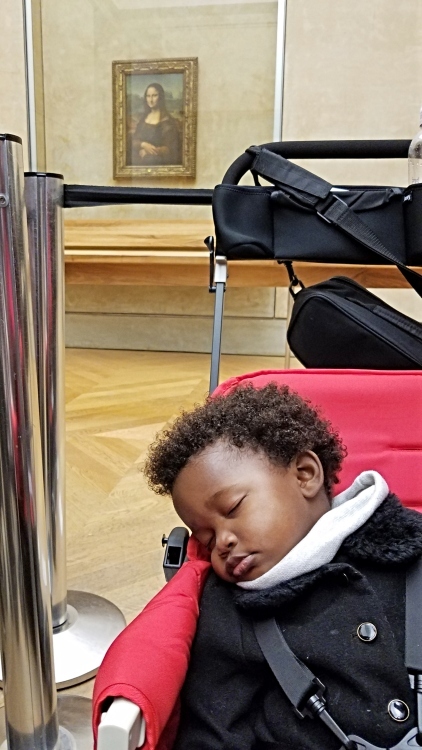 Kennedy slept through our entire Louvre visit, she was not playing around with her nap time but I still had to get a picture of her with the infamous Mona Lisa! After we explored The Louvre we visited Sacre Coeur. From October to April the Dome is only open from 9AM-5PM so we arrived too late to climb up but it’s accessible from 8:30-8PM the rest of the year. You can go inside the Bascilica year round from 6AM-10:30PM. I was a little bummed at first that we missed seeing Sacre Coeur during the day time but it ended up being beautiful at night. Just a 5 minute walk from Sacre Coeur is Place du Tetre. 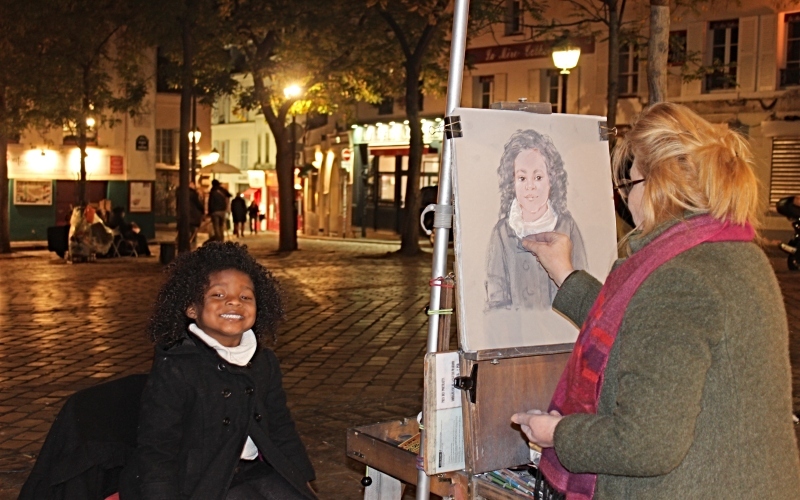 It’s a famous square in Paris with restaurants and an abundance artists looking to draw your portrait. Jordyn asked to get hers drawn and I was hesitant at first because I thought she wouldn’t sit still and waste my money but she really surprised me. She was so excited to get herself drawn she sat still for a full 35 minutes, even if the picture looks nothing like her! Never take the first price you are quoted, we ended up paying half of what the artist originally stated. They don’t have any printed price sheets so you know they are just spewing what they hope than get get from you. Try to see the artist draw someone else first to determine if you want them to draw you. It was late so there weren’t a lot of people when we arrived and only a few artists left so we didn’t get to follow this rule. 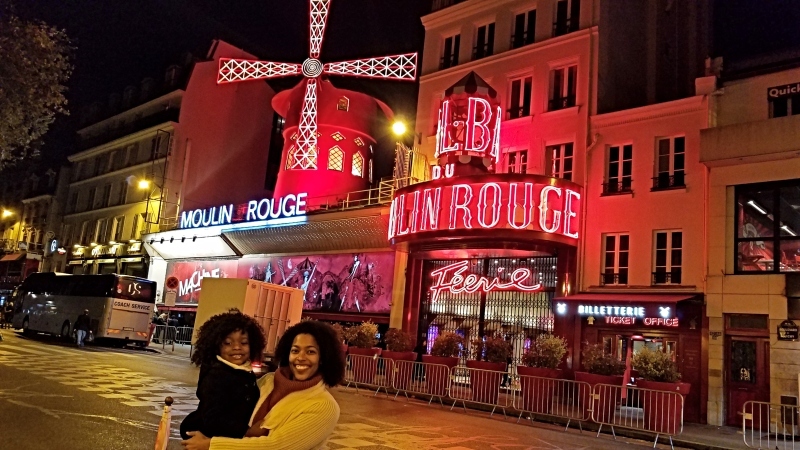 While watching a cabaret at the Moulin Rouge is not kid-appropriate stopping by to see and take pictures in front the infamous playhouse is still doable. It’s a 15 minutes walk from Place du Tertre. You go down some serious hills so hold on to your stroller if you’re using one. We started our 2nd day off visiting the Notre Dame which is free to enter but notorious for long lines. The only way to avoid these long lines is by booking a skip the line tour. If you want to climb the tower, that is at an additional fee and the line is typically extremely long. We had plans of climbing and actually booked this tour but we overslept and missed it, smh. After our time at the Notre Dame, we hopped on the L’Open Tour Hop-On Hop-Off Bus to visit Jardin du Luxembourg. 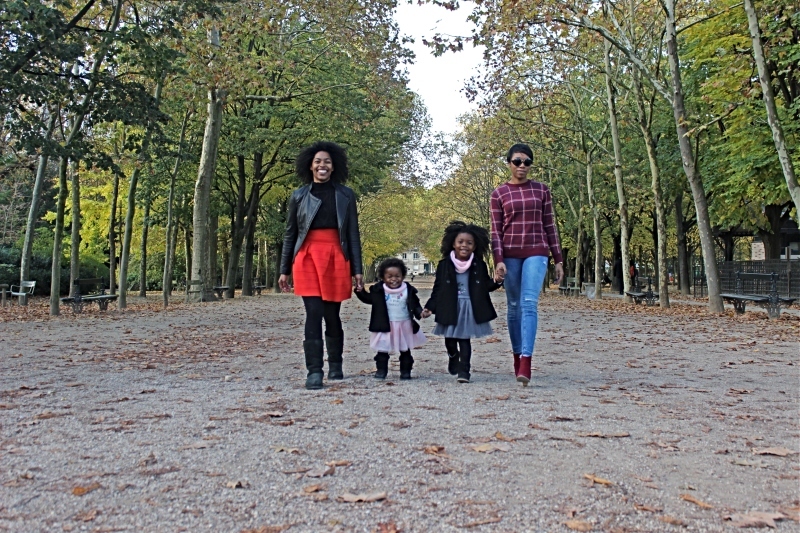 After eating a ton of pastries for breakfast the girls were ready to burn off some energy so Jardin du Luxembourg was the perfect place for our next stop. They had a great time running around the park, smelling the flowers, and even playing with rocks, because kids. 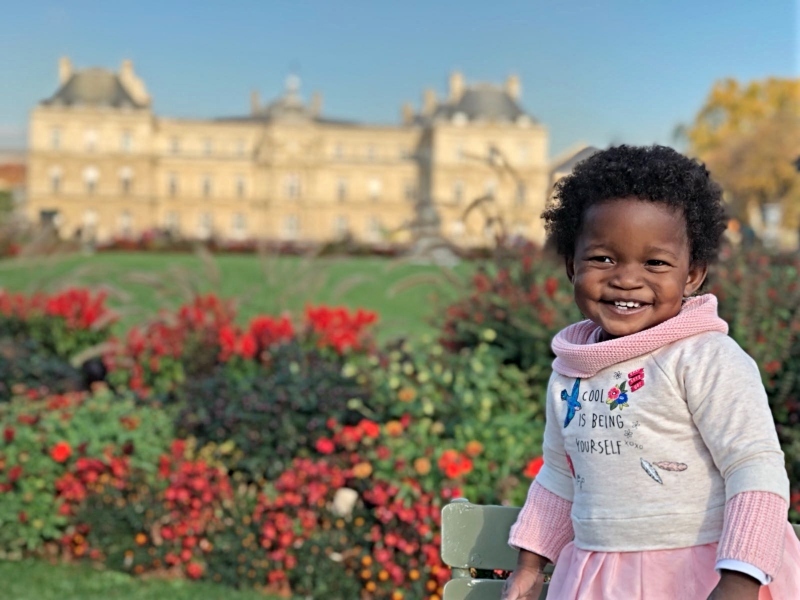 Fall really brings out some major beauty in Paris, and since we live in Florida the girls never see leaves changing colors or falling so that was a great experience for them. The park is beautiful and we all enjoyed the scenery, it was an afternoon well spent. We hopped back on the bus and went to Palais Royal or a toddlers heaven as I will call it from now. It’s a great place for the kids to burn off some energy. It’s literally only a square with black and white columns but the kids had so much fun running up and down them. The next major stop on the Hop-On Hop-Off Bus was the Arc de Triomphe. We really wanted to get to the Trocadero as the sun was setting so we opted to skip the Arc de Triomphe as we have visited on a previous trip to Paris. If you visit during the summer when the sun sets much later or don’t spend as much time as we did at each of the previous locations you can stop before the Trocadero as it’s the stop right before the Trocadero on the hop on hop off. The Trocadero is one of the best spots in Paris to get a picture with the entire Eiffel Tower in the background. 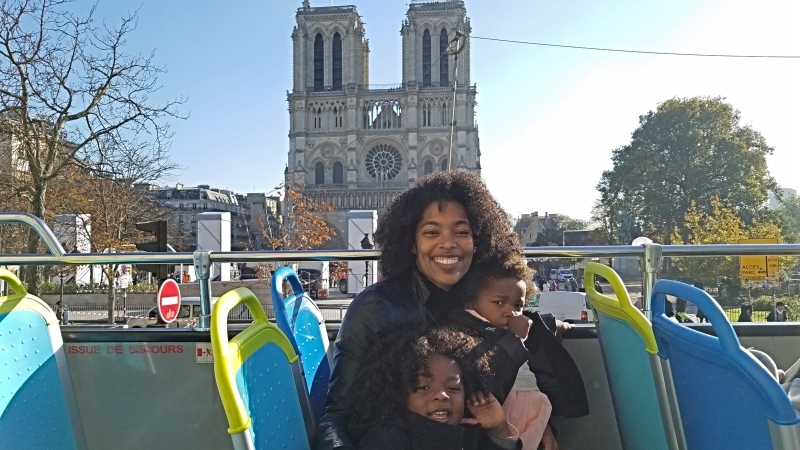 You can hop back on the Hop-On Hop-Off bus from here to take you closer to the Eiffel Tower but we chose to walk and stop by the carousel on the way to the Eiffel Tower. There is one directly in front of the tower but I assumed it would have been a lot more crowded so we opted for the one closer to the Trocadero. 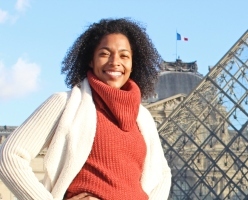 I don’t think the Eiffel Tower requires an introduction but here are a few tips on visiting. 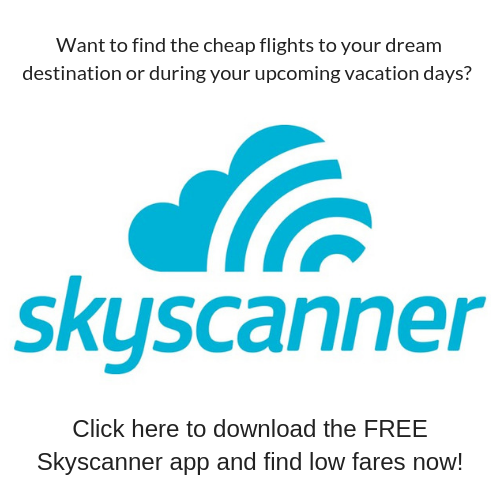 If you want to go all the way to the top be sure to buy your tickets online well in advance. The downfall is you have to select a time slot and if you are more than 30 minutes past your time you could be denied entrance. You can buy a ticket all the way to the top or to the 2nd floor and the prices varies based on your selection. Children under 4 are free and kids 4-11 are 50% off. If not you will be forced to stand on an extremely long line or buy a skip the line tour from a 3rd party operator. Viator has never let me down so I typically stick to booking tours through them. The tower is open from 9:30AM-12AM but allows its last visitors in at 11PM. Every night on the hour, starting at sundown, the Eiffel Tower lights up for 5 minutes. During the summer the last show is at 2AM and the rest of the year it ends at 1AM. We didn’t get to make it to the Palace of Versailles but note the Castle is closed on Mondays so plan accordingly. If you have an interest in visiting the Catacombs of Paris also note they are closed on Monday’s. 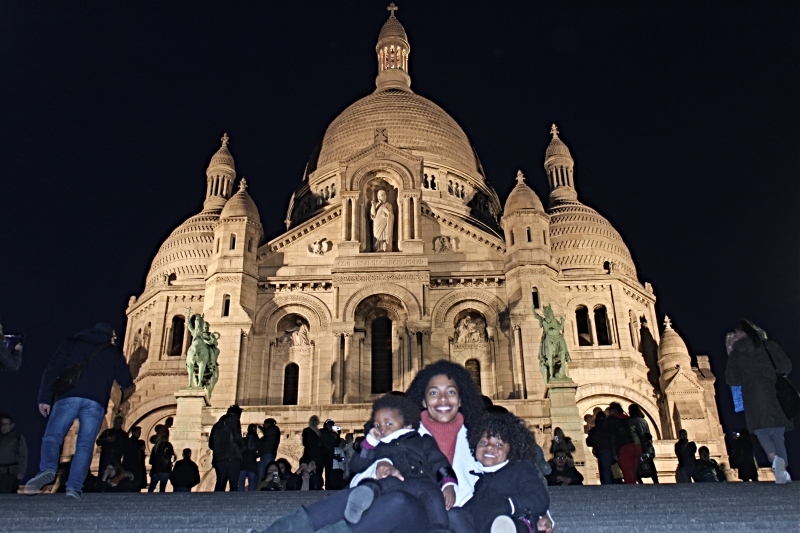 After our amazing two days in Paris with kids, we were off to use our Eurail Pass again. This time we were heading to spend 24 Hours in Brussels. 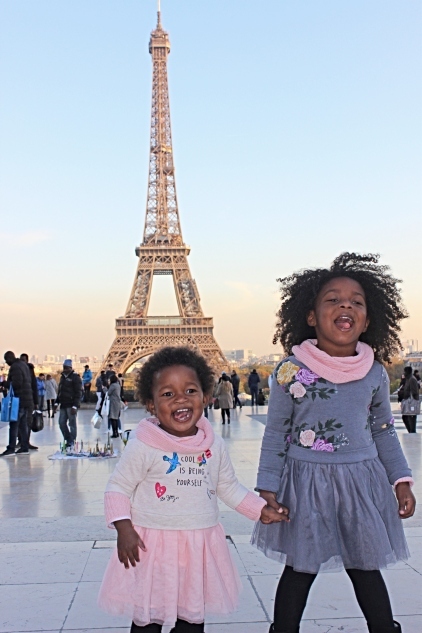 Did we help to plan your 48 hours in Paris with kids? If so please share this article! The hotel looks great. Did you request a king?